Scan Copyright © Airline Timetable Images. All rights reserved. Scan Copyright © Airline Timetable Images. 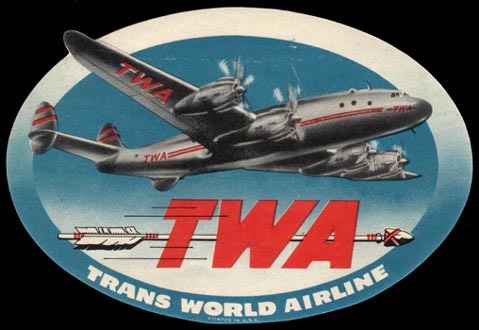 While the letters always fit, TWA did not always stand for Trans World Airlines. The company started in 1930 as Transcontinental & Western Air when Transcontinental Air Transport (a.k.a. T-A-T) and Western Air Express were forced to merge by the United States Post Office Department (now the U.S. Postal Service) in order to get more coverage for air deliveries. A side-effect of the power that allowed the government force such mergers led to the Air Mail Scandal in 1934. In that same year, the ensuing legislation passed to fix the problem dissolved the forced merger but Transcontinental kept the “TW&A” name. 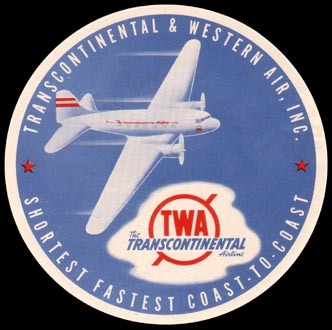 In 1946 after breaking Pan-American World Airways‘ legal monopoly on being the United States’ only international carrier, the company changed its name to The Trans World Airline. It was changed again in 1950 to Trans World Airlines, the name it held until December 1, 2001 when the TWA brand disappeared and the company was officially absorbed into American Airlines. 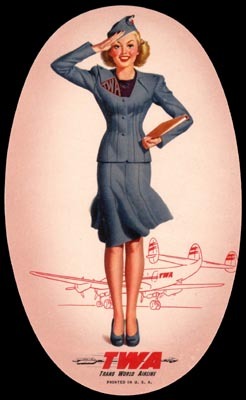 Posted in 1940s, 1950s, Retro/Vintage, TravelTagged 1940, 1946, 1950, airline, baggage, illustrationBookmark the permalink.